The Hong Kong Police Museum showcases a display tracing the development and history of the Royal Hong Kong Police Force from 1844 to today. 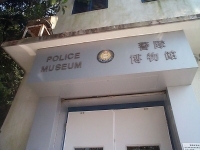 The main exhibit encompasses a significant number of artefacts relating to the Hong Kong Police Force from uniforms and firearms, to historical archives and photographs. Other exhibits look at the major factions which have influenced the status quo, namely the triad societies and narcotics (Hong Kong was founded on the narcotics trade), including a unique look at how heroin is produced. The Police Museum is an interesting visit, providing insight into the dedication of the officers who have served within this elite force. It is a small but informative museum with a little gift shop attached. It is not an interactive, multi-media exhibit so much as a simple but interesting archive of police history which will delight those interested in the subject but probably bore small children or those indifferent to the subject. There is a pleasant park next door to the museum where you can enjoy some shade and refreshments. Transport: Take NWFB Bus No. 15 (from Exchange Square to the Peak). Get off at the stop between Stubbs Road and Peak Road. Opening times: Wednesday to Sunday 9am to 5pm; Tuesday 2pm to 5pm. Closed Mondays and public holidays.